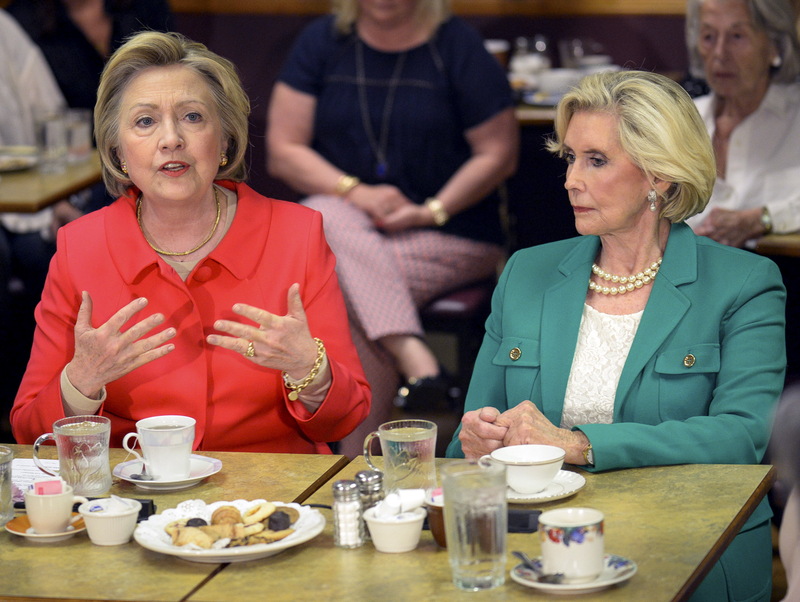 JENKINTOWN, PennsylvaniaIn a meeting with a small group of Pennsylvania women at a cafe here on Friday, Hillary Clinton looked ahead to the general election, and reflected on her critics, particularly Donald Trump, who has lately taken to referring to her as "crooked Hillary." "I'm not going to respond to what he says about me," she said of Trump. "I'm going to respond to what he has said about women in general. I'm going to respond to what he has said about immigrants. I am going to respond to what he has said about Muslims. I'm going to respond on behalf of all the people that have been the target of his hatred, and his demagoguery." Clinton said that, if she is the nominee, "we could very well have a campaign that is exactly all about that: insults, derogatory comments." Clinton's general election forecast came during a discussion about the challenges facing women in the workplace, including balancing a career with caring for a family and children. Clinton emphasized the need to "build up the confidence of young women" who are bullied. "Even the most confident, well-prepared girl has to be worrying, like, 'why are people picking on me?'" Clinton said. "So we've got to stand up against that." Clinton said the Internet, in particular, has "given a license to people to say things they would never say in person." "They would never say it to someone's face," she repeated. She acknowledged that her life in the public eye has meant a lifetime of criticism. "Take criticism seriously, because you may actually learn something," she said, repeating a line of advice she has given her supporters before. "But don't take it personally, because it can knock you to your knees." She added later: "It has taken me years to be able to say this...but I really have kept that in my head." On Tuesday night, after winning the New York primary by a large margin, Clinton told her supporters gathered in Manhattan that "the race for the Democratic nomination is in the home stretch and victory is in sight." Though it was one of her most confident assessments of the race to date, Clinton long ago started turning her attention toward Trump, as he racked up victories in primaries and caucuses across the country. "We have got to pull the country around to a point of unity, where we're all helping each other again," Clinton said in Jenkintown, where Democrats will vote in a primary on Tuesday. "We've got to change the culture so that it is no longer acceptable for people to say what they about others. You can disagree with somebody, that is fair game. But to launch personal attacks, to try to intimidate, and degrade somebody else is off limits."